Beautiful and made to be used! The most popular design in this amazing line of functional art. Each tomato has 7-8 layers of paint so they look fresh from the vine. They have been offered at the Museum of Fine Arts, Boston. Toss up your best greens with these trompe-l'oeil tomatoes. These bowls are priced individually. Hand wash, soap and water. No dishwasher or microwave. 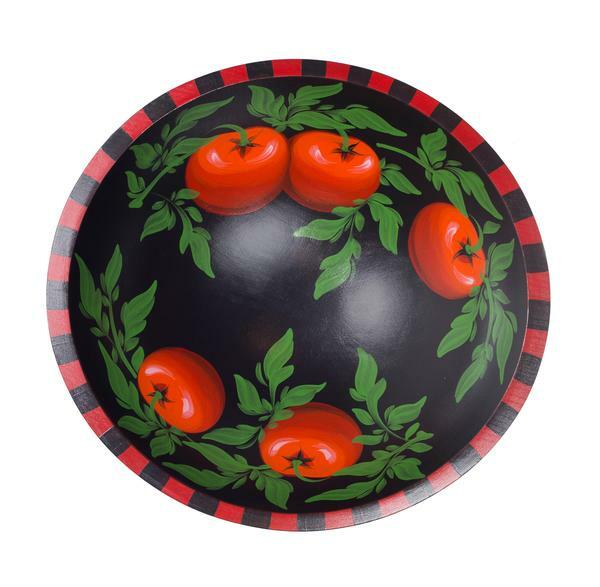 style="float: left;">"Our heirloom bowls are a cheerful addition to any home, inviting shared times around the table. Seeds of love and possibility are in each bowl we create. As a young mother and artist, I was searching for something that could incorporate my love of art and the home—and create a way for me to stay at home with my son. I never imagined that these bowls would one day be offered around the world. No business plan, just love in a bowl, and 20 years later we are more celebrated than ever. The magic is not just in the creation of each bowl, but about what happens in and around it. Savor, slow down, eat well, love life. I still live on my little one lane road where we create the bowls, one by one, in my studio. My son has grown up, while he is adding his own goodness to the world, the UPS truck still picks up daily, bringing our creations to you and yours. Thank you for being part of our journey. Soli Pierce, Sherwood Forest Design".